It’s a basic Paleo principle that you should get as much of your nutrition as possible from whole foods, not isolated nutrient supplements. There are all kinds of reasons for that. Supplements are often contaminated and the ones that aren’t are typically expensive. Taking a bunch of pills is annoying and hard to remember. But even if you’re happy paying out as much as you need to get the best supplements and don’t mind dedicating your second bedroom to your pill bottle collection, there’s another reason to get your nutrition food: nutrient synergy. 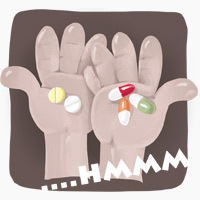 No, your vitamins aren’t sitting around in a circle holding hands and feeling their life energy. “Nutrient synergy” is the way that two or more different nutrients work together to produce an effect that you can’t get from either nutrient alone. Sometimes they help each other do the same job; other times, one nutrient helps you absorb more of the other. It’s a little bit like building a house. You can have a pile of bricks in one place, a separate pile of mortar, a third pile of shingles, and a fourth pile of drywall, but that doesn’t give you a house. To get houses that actual people can live in, you have to have a little bit of all those things and combine them. It’s the same way with nutrients: you can take some Vitamin C, some Vitamin E, and some other antioxidants, but it won’t give you all the benefits of eating fruits and vegetables. And you can even scale it up to food combinations and dietary patterns in general: certain combinations of foods are more effective at promoting health than the foods in isolation (wouldn’t you know it, these typically happen to be the same combinations typically found in traditional diets). We don’t even know exactly what it is in some of these foods that causes the effect, so we can’t possibly replicate it in a pill. But it’s clear that eating healthy foods will give you more benefits than eating isolated nutrient supplements, and an overall healthy diet pattern will give you even more benefits than just eating the foods alone. There’s more to food than the sum of the numbers on the nutrition label. Here’s the case for how that actually happens with some specific nutrients. Several studies show that antioxidants work better in teams – which is exactly how we get them in whole foods. Vitamins C and E, for example, are well-known as antioxidant buddy cops, which is convenient since they tend to come packaged together in a lot of the same foods (mostly dark leafy greens). This article makes the case for the synergistic effects of antioxidants and other polyphenols in the health benefits of fruits and vegetables. Trials of antioxidant supplements have had lackluster results compared to the obvious and well-studied benefits of eating whole fruits and vegetables, possibly because the supplements can’t recreate the full antioxidant experience. This study found that ascorbic acid (Vitamin C) and alpha-tocopherol (Vitamin E) worked synergistically with beta-carotene. Know what has all of the above? Spinach, kale, mustard greens, and other dark green leafy vegetables. In almonds, flavonoids work synergistically with Vitamins C and E to reduce oxidation of LDL cholesterol. In this study, intact freeze-dried broccoli was more effective for cancer prevention than isolated chemicals found in the broccoli. This study found that the anticancer effects of ginger are caused by synergy among all the antioxidants it contains, not just one. You could argue that antioxidants in a supplement would work synergistically just as well as antioxidants in the whole food, but that doesn’t account for the huge number of antioxidant phytochemicals that we can’t put in a supplement because we haven’t even defined or discovered them yet. You could wait to get all the good stuff in a tomato until scientists exhaustively measure every single phytochemical it contains and stick it in a pill for you…or you could just eat the tomato. Antioxidants can also work synergistically in combinations of foods – it doesn’t necessarily have to be just within the one food. To take one tasty example, this study found that consuming both red wine and olive oil at the same meal provided greater antioxidant benefits than consuming either one separately. This one found that adding milk or lemon juice to green tea improved the bioavailability of the catechins it contained. And this one found that eating tomatoes with broccoli was even better for prostate health than eating either alone. The obvious example is the absorption of fat-soluble vitamins: Vitamins A, D, E, and K need some fat to be absorbed. So isn’t it convenient that they often come packaged right with the fat in the same food? Think about Vitamin A in liver, Vitamin D in fish, or Vitamin E in almonds. With food sources that don’t naturally contain a lot of fat (like vegetables), it’s easy enough to add some olive oil or avocado (or both!) to your salad. Another example is B vitamins with Omega-3 fats. In this case, it’s not about absorption: B vitamins aren’t fat-soluble, but some evidence shows that B vitamins and Omega-3s may have synergistic effects on heart health. This may be one of the reasons why fish (a natural source of both Omega-3 fats and B vitamins) is such a healthy food, but isolated Omega-3 supplements have had mixed results for preventing heart disease (or anything else). Yet again, whole foods trump supplements. Supplements do have a place even in a healthy and nutrient-dense diet: if you pick them carefully and use them wisely, they can be absolutely great. But the majority of your nutrients should come from whole foods, partly because the nutritional content of whole foods is more than the sum of its parts. And the nutritional content of an overall nutrient-dense diet is even better than the sum of its whole foods. There’s a limit to how much we can know about foods by counting up their individual nutrients, and a limit to how much nutrition we can really get from supplementing with a smattering of purified vitamins and minerals. Whole tomatoes are better for you than isolated lycopene, and tomatoes eaten with other nutritious vegetables are even better than whole tomatoes. It’s about the big picture – so go grab yourself some tomato and spinach salad, and chow down on a big plate of nutrient-dense foods; it’ll do you better than a supplement, and it’s tastier to boot.